'Hakuna Matata' is a sailboat that allows you to sail both in the tropics and in Antarctica. You are completely autonomous. The ship is incredibly strong and can handle almost all weather conditions. Due to its structure - long keel - it is not a racer, but rather a comfortable ship, which does not hit the water (like many modern sailboats), but rather "soft" through the waves. Lies also calmly for anchor. Cruising speed 8 knots at 2200 rpm. One previous owner, who made the ship to his own wishes. The first owner sold the ship for health reasons. I bought the sailing ship about 15 years ago and want to sell it now because of "advanced age"
SLOOP CUSTOM BUILT at Vandewerf and Visser (Nl) in Aluminum. LONGKEEL. Wood constructions of Haquebo (Nl). Germanischer Lloyd approved. Located in Puerto Calero, Lanzarote, Canary Islands, Spain. Engine Mercedes (Schwarting) Turbo Diesel Type S-352 168pK; Engine compartment fully noise insulated. There are 3 waterproof compartments (theoretically, the ship is therefore unsinkable). First part in front, till the kitchen; second part engine room; then the back part of the ship. All glass, except in the cockpit, is made of safety glass. You can stay straight up in the engine compartment. 4500l diesel in 2 tanks (aluminum) with bulkheads and a big manhole + 1 tank of 600l, which can easily be adapted as waste tank (at the moment not necessary in Lanzarote). 2 x 1000l water tanks in aluminum, with special coating on the inside. U and L sofa in the living room and in the kitchen, are in alcantara. 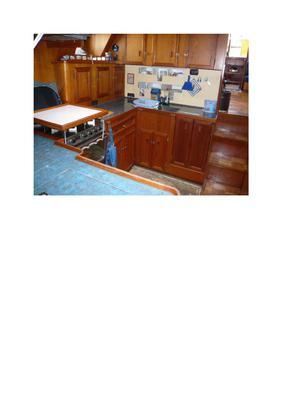 Inside the ship, centrally located is a higher seating area of approximately 4m x 4m with table. To the right is a desk board. Cushions and seat covers are made of blue and green alcantara. All windows on the side of the ship are double glazed. Outside these windows, stainless steel plates can be applied so that windows cannot be pushed in a very heavy storm. Three steps downstairs is in the kitchen, fully equipped with gas oven, microwave, 2 large fridges and 1 large freezer, 2 very deep stainless steel sink. On the left is a dining area for up to 5 to 6 people. Further to the front, on the left side is a toilet Rheinstrom with macerator, basin and a big shower. At the back of the central seating area, 3 steps down, you have first a small room for tools and you go through a watertight door to the engine compartment. At the back of the ship is the master cabin (double bed) with further a fixed toilet Rheinstrom with macerator, washing machine, showers and a small sitting bath. The cockpit outside (about 3m x 3m) is fully covered with a wooden, covered with polyester, roof (no sprayhood) with a big sitting area and a folding table. The cockpit is completely shaded. Even in the hardest weather at sea, the cockpit stay dry. The cockpit can also be completely closed to the wind side with clear thick plastic (both sides and back), so that you can be completely protected from the wind, coming from whichever side). Outside in front is a large storage room with the diving compressor and spare ropes. At the rear, there is a very large storage space that, years ago, was used to storage even a Honda Dax. 2 fridges + 1 freezer (3 compressors). Total 300l. - Mainsail is hydraulic in mast furling (Bamar). Genoa is operated with the electric winches. Stormfok idem. All sails can be operated from the cockpit by 1 person. - UKW Sailor, Icom SSB, Fastnet Radio Marine Decoder, Furono Weather Cards Writer. - Inside Bose Surround music system with 5 boxes and subwoofer. - New (2015) Eberspächer heating system with diesel, via hot water and radiators. 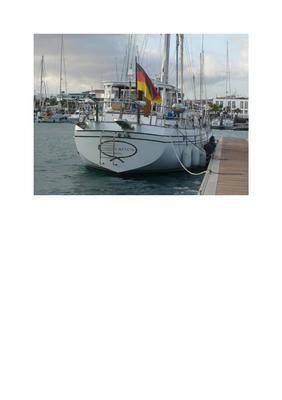 In 2001, a complete refit has been done with many new instruments, new sails and has been fully repainted and new antifouling. We started a new refit from 2013. Meanwhile, a larger and heavier (20pK) bow thruster has been fitted, and the front stow room, the full engine compartment and rear storage room has been completely repainted. What still has to be done is: new teak and re-painting the ship. Antifouling has been new for 2 years. (The last time the antifouling has lasted 10 years, is special for commercial boats). Between 1998 and 2007, we were sometimes 6 months a year (divided into different periods) on the boat. 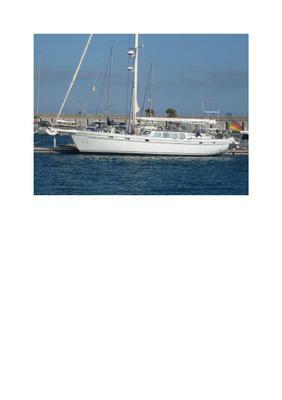 Our sailing experience is limited to the Canary Islands; Portugal and South Spain and the Cabo Verde Islands. The last 10 years, we are more in Mallorca, in a finca; that means that, the last 10 years, we are only 6 weeks to 2 months on the Hakuna Matata. This is why we would sell the boat (I am already 71 years old). 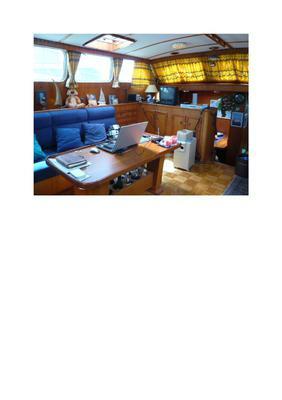 FIXED price in the condition, the ship is now: 420,000 € (free of VAT), without new teak and not repainted. 'Hakuna Matata' means 'No Worries' in Swahili.